The gatetrix insulator is designed to take both 40 mm - 20 mm tape as well as rope, twine and steel wire. The patented design of the insulator actually grips and holds tape securely without the need for rubber inserts. Once screwed on to the post it is very easy to insert the tape and tension the fence as you go around. The Gatetrix Insulator has the ability to take two lines of rope (twine or steel wire) they are spaced 4 cm apart. This configuration is very useful where a earth line is required. 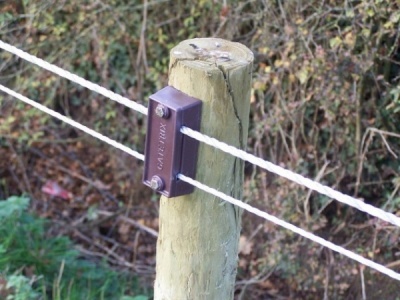 Typical uses are for long fences, dry and arid conditions, delivering a strong shock to "tough" animals i.e. wild boar, bear, wolf. A more common place use would be long sheep fences that are on dry sandy soil.